Keeping your wedding guest list to 10 or under can be freeing for multiple reasons. Not only will you be living more lightly on the land, but you’ll have an excuse for not inviting Aunt Martha. Plus, you open up your wedding location options to almost anywhere. 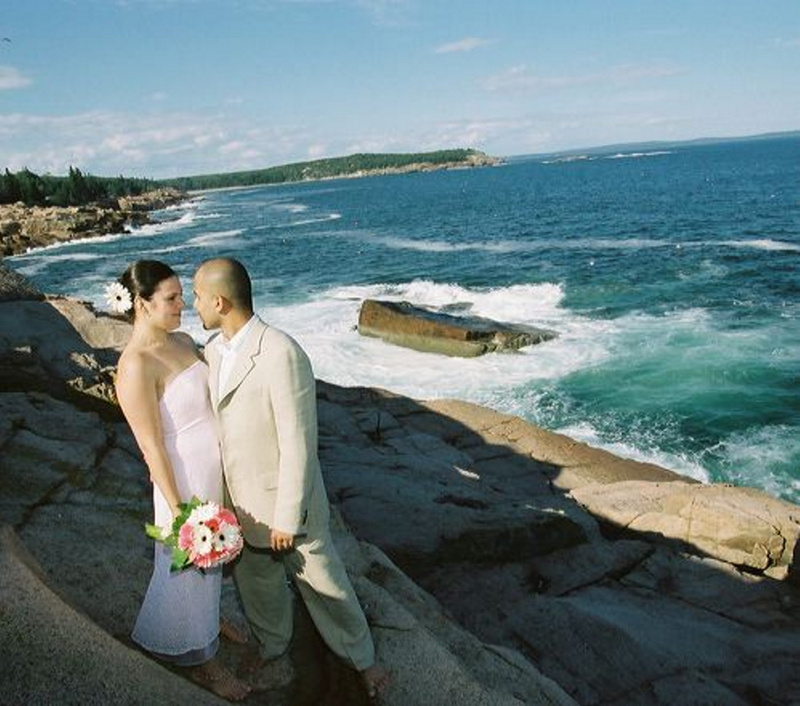 You could gaze down over the whole Moosehead Lake region or feel Acadia’s Sand Beach under your feet as you wed. The seriously nimble could even say “I do” on Mount Katahdin. Not to sound too Dr. Seuss about it, but think of the places you could go with your small wedding, while spending less and leaving a (comparably) dainty carbon footprint. It’s also in vogue, apparently. Katherine Jameson of Katherine’s Event Planning specializes in small weddings (which she describes as elopements, although they’re not done in the dark of the night to avoid angry parents). Her specialization was never an intentional business strategy; she has merely responded to a demand from marrying sorts. “They want to be as close to nature as they can get,” Jameson said. And they’re willing to go very small to make it happen. “That seems to be the trend I have been seeing probably for about the last four years,” she said. These days she might book one wedding a year with a guest list of 100 or more; the rest are intimate affairs. Her clients tend to be from out of state, and some have never been to Maine. But they call and ask for the best, and often most dramatic, outdoor setting possible. Maybe they bring their parents and two best friends, or if they’re older, children from a previous relationship. 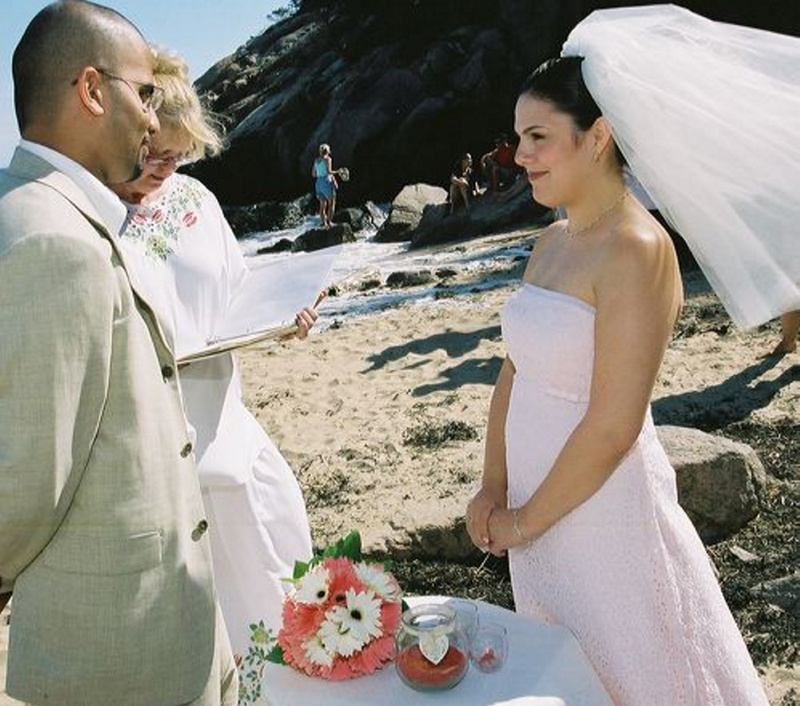 She finds these couples an officiant, arranges for a hair stylist, musical accompaniment or a lobster dinner for later, and determines the best strategy for getting bride and groom, or groom and groom and so on, out to the likes of Otter Cliffs or Sand Beach in Acadia National Park. Parties of 10 or fewer don’t even need a permit, but as anyone who has ever been to Sand Beach knows, they will need good timing. “That is a challenge in getting married there, because you cannot reserve a parking space,” Jameson said. Early or mid-June, before school gets out, might work for their public but preferably intimate wedding ceremony, as might early morning or early evening, when the crowds are thinner. “You just hope for the best,” Jameson said. And be prepared to move to a different spot on the beach or rocks. At Acadia, there are rules, but they are hardly onerous. “They won’t allow you to bring in chairs, and they don’t want you to throw even petals,” she said. The latter rule is to protect the wildlife from any outside plants that might not sit well with the species that make their home in Acadia. Also unheard of for Jameson? Anything other than requests for the coast as a location. “Everyone wants the sea,” she said. 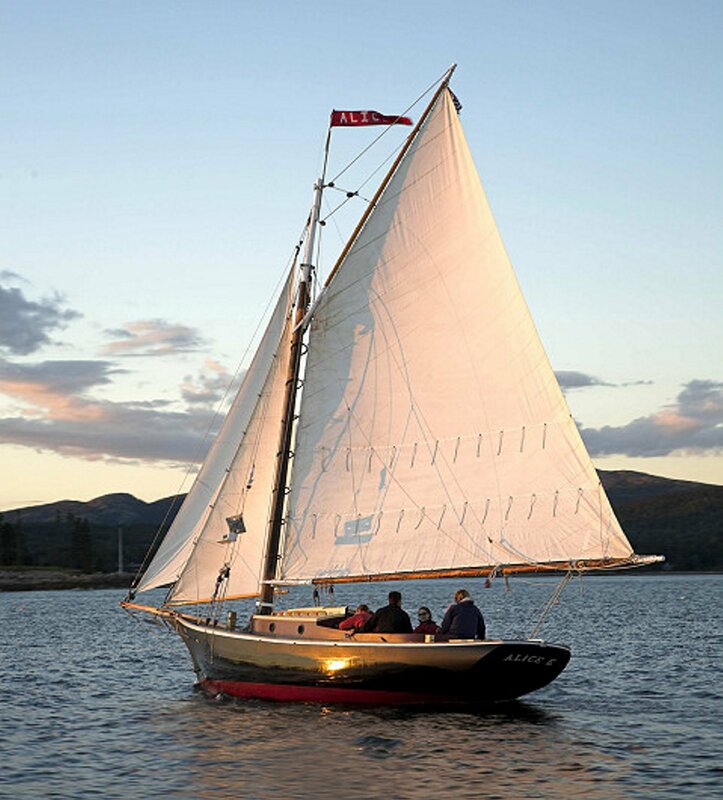 Couples who want to be married on the water could rent the Friendship sloop Alice E.
Couples who want to be actually on the sea rather than next to it could charter a Windjammer, like the J.&E. Riggin or even a pair of Friendship sloops. SailAcadia’s Karl Brunner said Friendship sloops Alice E and the Helen Brooks each hold six people, plus the crew. For day rates of around $1,000 per boat, couples could request a sail to a deserted island (or say, one on the Maine Island Trail) to be married on a beach. 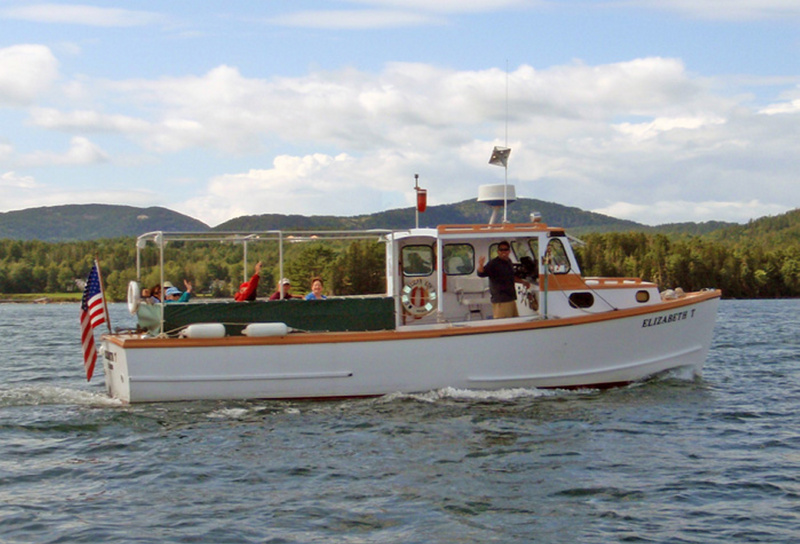 SailAcadia also has a lobster boat for hire, which Brunner uses to take customers out for a lobster bake on the shore (about $2,500 for a six-hour cruise). The guest list has to be limited out of necessity; the boat’s capacity is 20. Planning this kind of event is only for those who can hold firm on their numbers, whether in the name of sustainability or sensibility. If those numbers creep upward, the 120-foot J. & E. Riggin can accommodate 24 guests for an overnight trip and 45 for a day trip (that starts at about $2,500). No need to save room for an officiant, because the captain, Jon Finger, is certified to perform weddings. 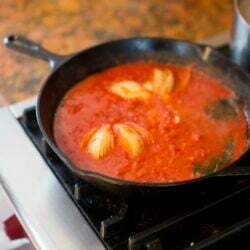 His wife, Annie Mahle, does the cooking, including, yes, a locally sourced meal. 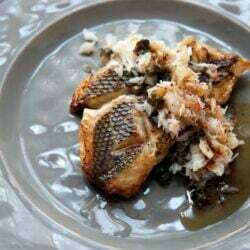 “Usually people who come to us are looking for that anyway,” said Mahle, who has been a food columnist for the Press Herald and last summer wrote about cooking on board. Couples who want to be married on the water could rent a lobster boat. Photo courtesy SailAcadia. The Windjammer has hosted some memorable weddings, including one deliberately planned for the middle of the night in order to catch a full moon. Just the captain, crew and the couple. Oceanfront weddings might be more popular but it doesn’t mean small weddings aren’t happening elsewhere. The caretakers of some of the state’s greatest inland beauty areas say they’re familiar with these quick, low-key dashes into a scenic area to exchange vows. “Usually we have from one to a few during the year,” said Baxter’s Bissell. “People usually contact me and ask.” There’s no popping of champagne – or any other alcohol – allowed but, other than that, not much in the way of restrictions. Bridal parties can book group camping sites at Katahdin that hold up to 25 campers, although they’d have to be on the ball to do so; reservations for a summer camping trip must be booked four months in advance. For those who aren’t up for a hike, here’s a suggestion. Height of Land, the stunning outlook on Route 17 near Rangeley, has undergone extensive enhancements (about $5 million) in recent years through joint projects of the Department of Transportation and the Rangeley Lakes Heritage Trust. The state owns the outlook and parking area itself, which means that a small party can slip in in a couple of cars, get out and have a wedding from one of the best vantage points in the state. “I have heard that people have gone up there with smaller groups to get married,” said Chris Devine, executive director of the land trust. He recommended checking in with the Department of Transportation before making a plan. And be sure to keep it small. “If you showed up there with 250 people and a caterer and a sound system, I think they would probably frown on that,” he said. But when you’re at a place so magnificent that it’s called the Height of Land, who needs the trimmings?